In a historic building on Staten Island, adjacent to the harbor, The St. George Library Center is a dynamic resource for community members offering a main reading room since 1907, a computer lab since 2001, and most recently, a Teen Center, completed by Highland Associates. 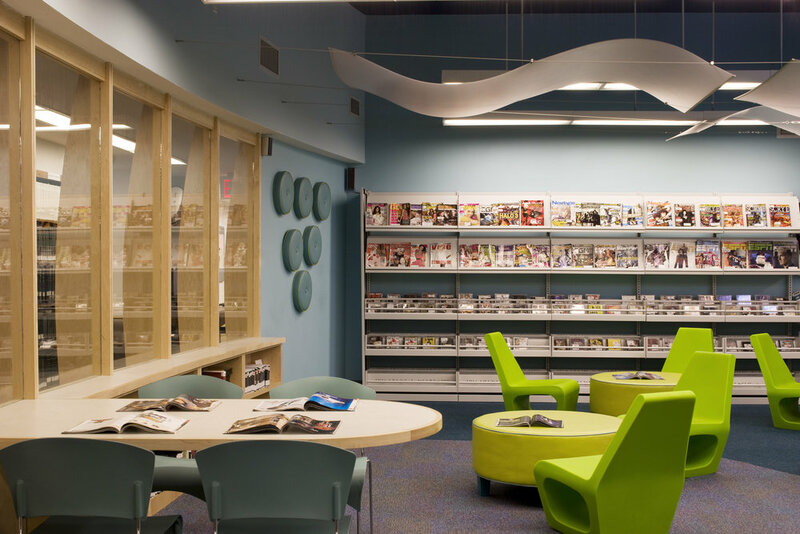 A renovation of approximately 2,000 square feet of space, including architecture, interior design and related MEP engineering services, the project's goal was to create an inviting space, separate from the main area, for teens to interact and explore the library's resources and multi-media technology. Highland's design team discovered a spectacular view the Library has of the New York harbor through glass windows in the main reading room. Inspired by the view and building upon the community's connection to the harbor, Highland developed a nautical theme for the Teen Center. Encapsulating the space is a glass wall, bowing slightly, supported vertically by curved wood planks replicating the hull of a ship. Constructed in the base of this wall are shelves for periodicals and books, and emerging from the wall are tables for reading and working space. Carefully constructed, the wall was built offsite (like a boat) and installed in less than a week as a solid stationary piece. It transformed the tired space and also anchors the room and its remaining elements. 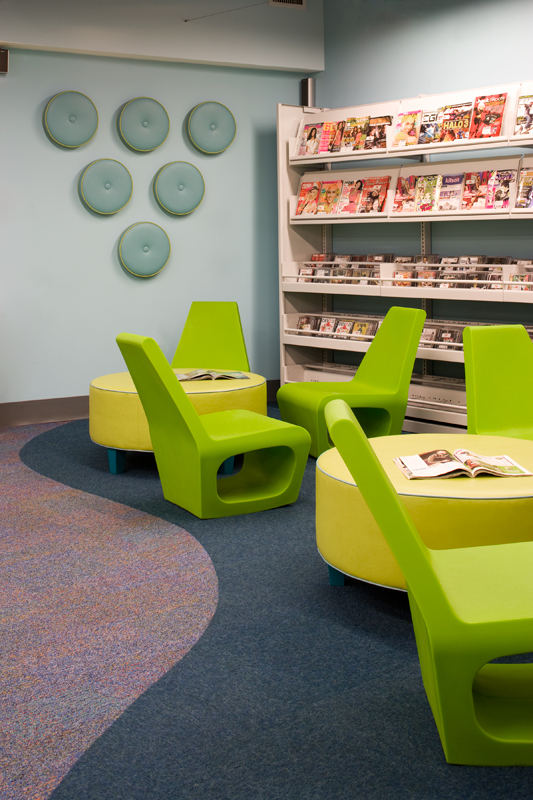 Ocean colors invigorate the space; books and magazines scale the blue colored walls and neon green furniture provides a lounge space in front of the plasma TV. 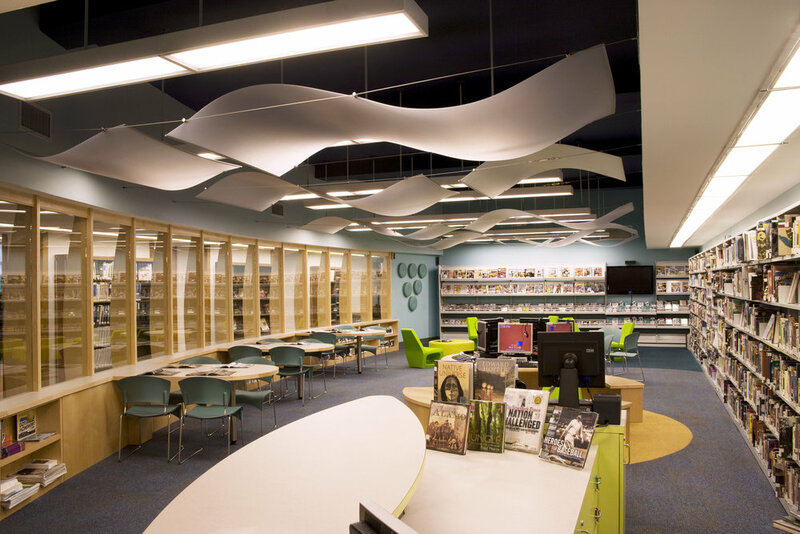 Spanning the ceiling are curved plastic "sails" to simulate the movement of the ocean wind. 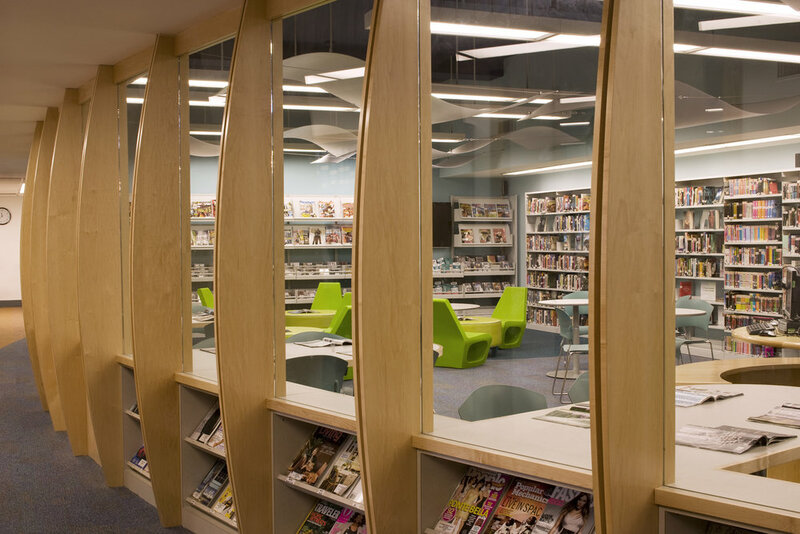 The space is centered with a circular workstation of computers for teens to search the library database.